• It quickly frees the aquarium from the pollution created by nitrates, phosphates, silicate and ammonium ion, removing organic, nitrogenous waste. • It permanently bonds nitrates, phosphates, Silicate and Ammonium Ion even after the exhaustion of its absorbing capacities. • It vigorously fights against the growth of algae. • It makes the water clear. • Fish are healthier and more protected. • The aquarium requires less maintenance. • It can be inserted into the main filter as last layer, or into a separate slow circulation filter. The life of the product depends from the water degree pollution. For a correct management of the filter is recommended to insert the activated carbon after absorb materials. open the capsule and pour the powder on the product into the filtering sock (supplied inside the package). • It quickly frees the aquarium from the pollution created by nitrates, phosphates, silicate and ammonium ion removing organic, nitrogenous waste. • It vigorously fights against the growth of algae and the proliferation of DIATOMEE. • It prevents calcium from falling. • It helps the growth of corals, marine invertebrates and plants. Highly micro-porosity chabasite rock granulate, sought after for its strongly selective adsorption properties towards cations. • Mechanical filtering – the external structure favours the deposition of suspended particles. • Biological filtering – its internal micro-porous structure, having a high surface area and uniform pores with one or more sizes, helps the proliferation of nitrifying bacteria and the reduction of the nitrogenous compounds level. • Absorbing filtering – its chemical nature favours a selective absorption of all toxic substances, such as, ammonia, ammonium, sulphates, as well as heavy metals, pesticides, aflatoxins, gas and unpleasant Smells. Thanks to its versatility as filtering material, it is particularly suitable for goldfish basins and in presence of highly polluting aquatic animals, such as turtles. 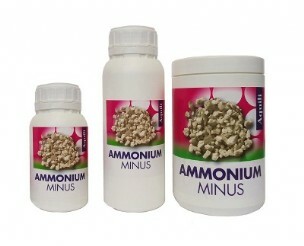 It is effective in fresh water only; in salt water the ammonium ion is transformed into ammonia that does not interact with this type of absorbent materials. • It quickly frees the aquarium from the pollution created by nitrates, removing organic, nitrogenous waste. 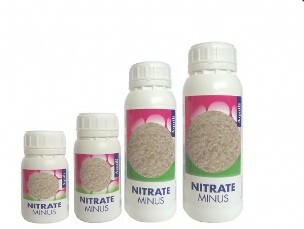 • It permanently bonds nitrate even after the exhaustion of its absorbing capacities. • Fishes, invertebrates and plants are healthier and protected. For fresh and sea water aquariums. 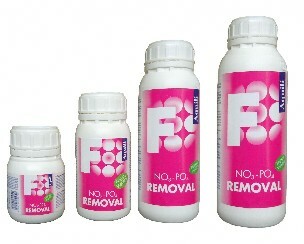 Removes phosphates - PO4 from fresh and sea water. • It quickly frees the aquarium from the pollution created by phosphates. 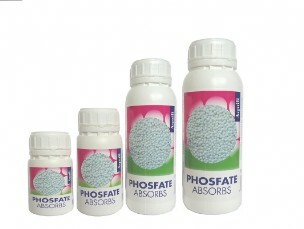 • It permanently bonds phosphate even after the exhaustion of its absorbing capacities. Its theoretical absorption capacity is about 20,000 mg / l, but in the form available on the market, the product is very wet and this lowers the absorption capacity to about 12,000 mg / l.
very important and they are not harmful but only if they are present in very small quantities. 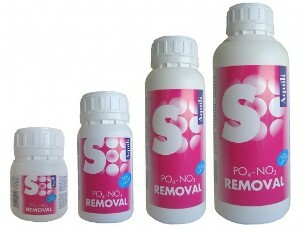 essential to use specific products which reduce the level of PO4. 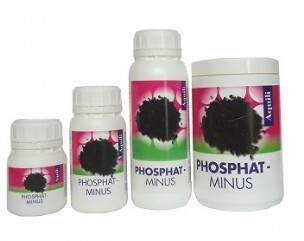 phosphates. 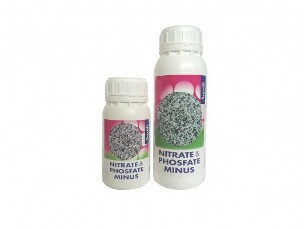 Phosphat – Minus bonds large quantities of PO4 without interfering negatively with the water in the aquarium. • It does not cause problems for susceptible fish or invertebrates. • It is a mixture of absorbent material highly effective in the removal of nitrates, phosphates and silicates in both fresh and seawater. • It quickly frees the aquarium from the pollution created by nitrates, phosphates and silicate removing organic, nitrogenous waste. • It permanently bonds nitrate, phosphates and silicate even after the exhaustion of its absorbing capacities. For a correct management of the filter is recommended to insert the activated carbon after absorbent materials.